This is probably one of the most notorious conditions, and most well known. Plantar fasciitis is a condition wherein the plantar fascia is pulling on the periosteum at the calcaneus therefore causing inflammation and pain. The plantar fascia is connective tissue that acts as a stabilizer and maintains the integrity of the arch of the foot. 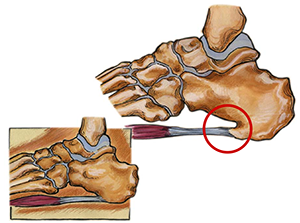 It originates at the plantar aspect of the calcaneus and is attached to the metatarsal heads and continues forward to insert on the proximal phalanges as well as forming the fibrous flexor sheath in each toe.